Employers who aren’t connected to another company or charity will have an Apprenticeship Levy allowance of £15,000 each year. The allowance reduces the amount of Apprenticeship Levy you have to pay by £15,000 across the year. This means that in practice only employers with an annual pay bill of more than £3 million will pay the levy. The levy is charged at a rate of 0.5% (i.e. the employer will pay 0.5% of the ‘annual pay bill’ that exceeds the annual ‘levy allowance’). 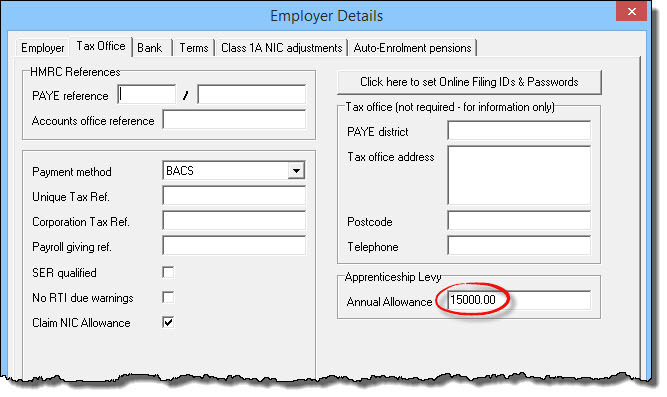 Payroll Manager automatically assigns the £15,000 annual allowance to all employers by default, and stores this figure on the ‘Employer Details – Tax Office’ screen. 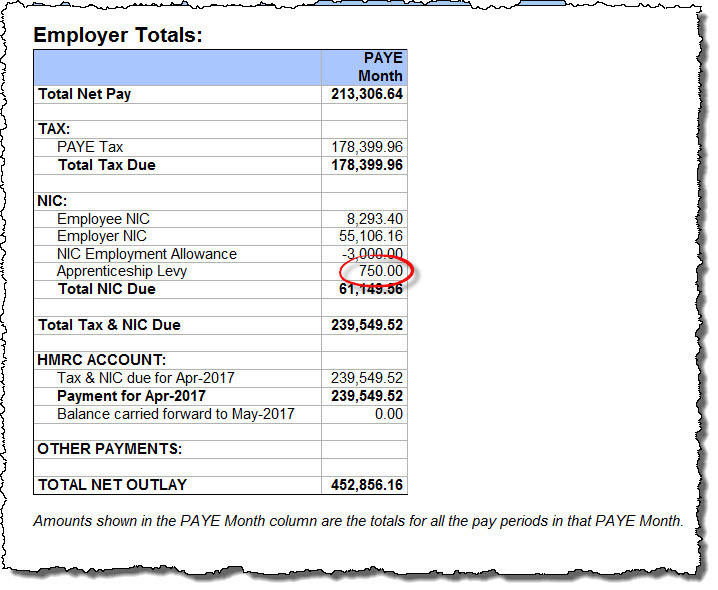 IMPORTANT: This figure should not be deleted or edited unless you have more than one PAYE scheme or are connected to other companies or charities and need to split your allowance between these schemes, as this will result in an incorrect calculation of the Apprenticeship levy for that employer. The Apprenticeship levy is charged at 0.5% of an employers ‘pay bill’, and is automatically calculated by Payroll Manager each tax month. In many cases, where the employer’s ‘annual pay bill’ is likely to be below £3 million, the result of the levy calculation will be zero (because the levy amount is below the allowance). In such cases there is nothing that the employer needs to do with regards to either paying or reporting the levy for that month. The allowance operates on a ‘cumulative pro-rata’ basis, meaning that the year-to-date allowance at month 1 is £1250 (£15,000/12), the year-to-date allowance at month 2 is £2500, etc., up until month 12, where the year-to-date allowance is £15,000. 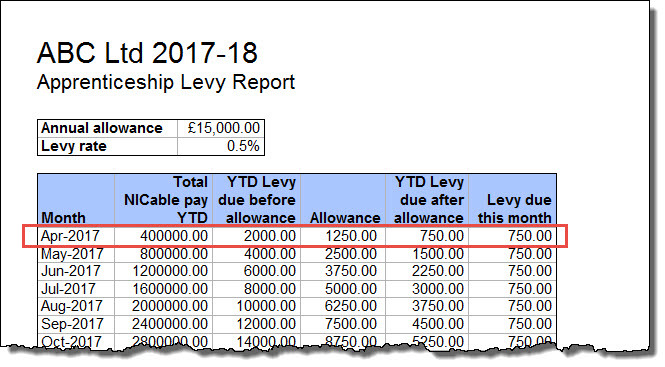 If the calculated Apprenticeship levy exceeds the allowance for the year-to-date then the employer must pay the levy and report these amounts via an Employer Payment Summary (EPS) in the relevant month(s). Payroll Manager will schedule the EPS automatically. The examples below show how Payroll Manager will handle the Apprenticeship Levy. The first example is for a typical small business, which will not be liable to pay or report the levy. The second example is for a much larger employer, which will be liable to pay and report the levy. For a large majority of small and medium sized employers there will be no Apprenticeship levy to pay, as their annual ‘pay bill’ will be below £3 million. The graphic below gives an example of an employer with 10 employees, with each employee being paid £2000 per month. The monthly ‘pay bill’ for this employer is £20,000. The calculated Levy for April (£100) is lower than the allowance for April (£1250), and so the amount payable is zero. 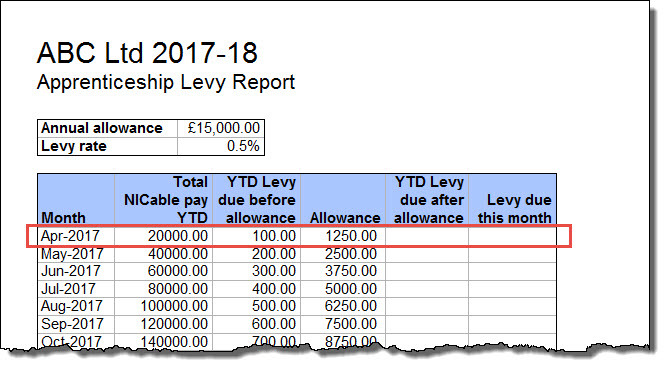 The report below can be produced by clicking ‘Analysis‘ then ‘Apprenticeship Levy‘ from the main menu in Payroll Manager. The graphic below gives an example of an employer with 200 employees, with each employee being paid £2000 per month. The monthly ‘pay bill’ for this employer is £400,000. 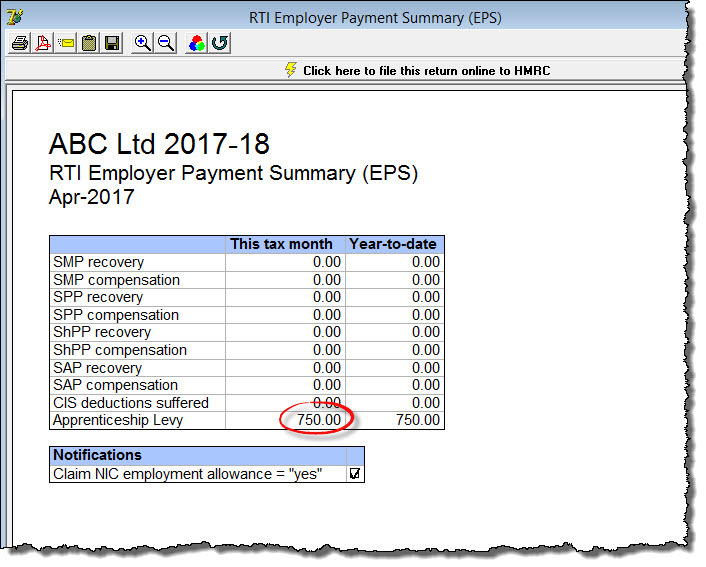 The Apprenticeship Levy amounts will also appear in the Employer Totals section of the ‘Pay – Employers Summary for Tax Period‘ report for each relevant month.